This table clock, designed by Swedish goldsmith, Baron Erik Fleming, truly captures the spirit and wonder of travel in its depiction of a globe. Spinning on its axis hour by hour, this clock lets the viewer explore the many vast places in the world, from the massive continents of the Americas, to the tiny islands of Oceania, all lightly etched into the smooth silver surface. 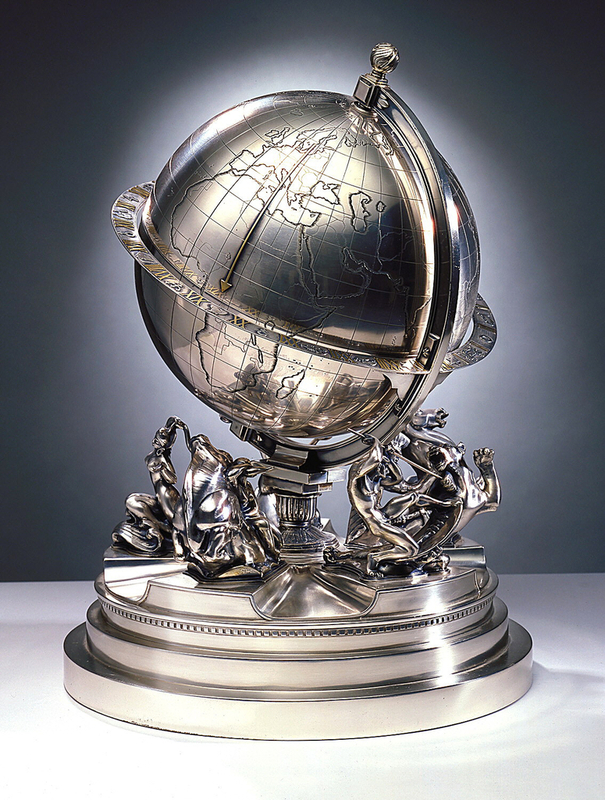 The silver material evokes Fleming’s ties to traditional silvermaking techniques, as he uses precious metals and craftwork to show his reflection on the past, contrary to the visionaries of the Modern Age at the time. As a designer who was known for reinterpreting the Queen Anne style in Scandinavian craft, he incorporates these qualities of tradition from his attention to decoration and detail on the globe itself, to his dramatically posed statues surrounding the globe, which represent personifications of the continents. The decision to include these details shows the designer’s statement in reaction to the simple geometric characteristics of Modern styles, such as the New World Radio clock by Raymond Loewy, also included in Cooper Hewitt’s collection. The sheen of the silver completes Fleming’s adoration for older styles, as he uses a more traditional material instead of the brand new inventions of Modernism, such as Loewy’s use of Bakelite for his radio. Sebastian Grant is a Masters student in the History of Design and Curatorial Studies at Parsons: School of Design, and a Cooper Hewitt Fellow in the Publications Department. Lars Fleming, Letter to Hedy Bäcklin, September 1960, Cooper Hewitt Museum Collection. Bill Wilson, “Kreuger: The original Bernard Madoff?”, BBC News, Last Modified March 13, 2009, http://news.bbc.co.uk/2/hi/business/7939403.stm. “The Match King,” The Economist, Last Modified December 22, 2007, http://www.economist.com/node/10278667. Hedy Bäcklin, Letter to Atelier Borgila, September 23, 1960, Cooper Hewitt Museum Collection. Patricia Beard, After the Ball: Gilded Age Secrets, Boardroom Betrayals, and the Party That Ignited the Great Wall Street Scandal of 1905, (New York: Harper Collins, 2004). Hedy Bäcklin, Letter to Lars Fleming, November 23, 1960, Cooper Hewitt Museum Collection. Bäcklin, Letter to Atelier Borgila.